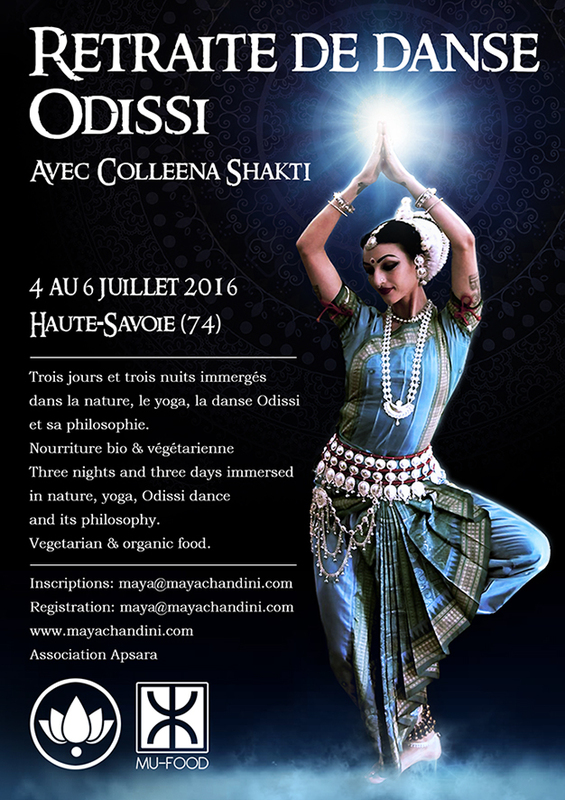 Retraite de danse Odissi avec Colleena Shakti 4-5-6 juillet à Bogève dans la merveilleuse « Vallée verte » (74), France. Trois jours et trois nuits immergés dans la nature, le yoga, la danse Odissi et sa philosophie. Cette retraite est destinée aux danseuses désireuses d’ expérimenter la danse en « dévouement ». Du rituel sacré au renforcement du corps et de la technique, nous savoureront ensemble l’ immersion dans la danse de Jaghannath. This is a description of our syllabus for introductory level Odissi training. Progression through the material is determined by student’s proficiency.Choreography taught will depend on students level of experience and proficiency in Guru KeluCharanMohapatra style Odissi. Strength Training warm up: 15 mins. With careful guidance through Gurukal (rigorous one to one) style teachings under Swami VidyadishanandaGiri (monk and esteemed Sanskrit master of India) in subtle yoga techniques of the VinyasaKrama yoga tradition, Colleenahas integrated this yoga into her dance training programs as a way to unlock and cultivate energy from that limitless source within. Receiving additional training under ShrivatsaRamaswami (direct disciple of Krishnamacharya) in related a VinyasaKrama Yoga style, she follows her masters guidance to share with students a well rounded practice designed for dancers looking to increase endurance, deeply embody and developstrength from the inside out. The focus of this yoga practice is to open the body up through movement of Prana (vital energy), rather than forceful stretching of muscles and ligaments. Our practice unfolds with: Asana –VinyasaKrama Sequences, Pranayama, Chanting and finallyMeditation, working with all the layers of the body/consciousness. Each day of training will include some strength training exercises from: Indian classical dance, South Indian martial arts (Kalaripayyatu), Pilates, ballet techniques, orthopedic exercises and more. All classical Indian dance style refers back to the ancient treatise on dance – NatyaShastra, as well as the AbhinayaDarpana to find its dance vocabulary. We will focus this workshop on learning important mudras and their common uses, head positions, foot positions, turns, gazes, walks, full body postures and more. A student of Indian dance studies and memorizes this vocabulary to speak the language of their particular style and grasp it’s vast potential. This class will offer a methodical way for note-taking and memorizing the complex dance of Odissi. The foundation of classical dance is build strongly so the layers of complexity blend together with clarity and precision. Odissi dance training begins with 22 dance phrases segregated by the 2 main postures used in the dance: Chowka and Tribhangi and performed at various speeds. Students can expect an introduction to several of these Stepping exercise as well as the Tihayi compositions. Lectures on dance vocabulary of the NatyaShastra and AbhinayaDarpana in the Odissi style, related philosophy, history, culture, music theory and terminologies. The “sanscritization” and “classicalization” process of Odissi from a devadasi temple dance tradition – Odissi’s history. Reviewing a close account of artistic and cultural elements, which drew together to create the masterpiece style known today asOdissi, and how the name –Odissi come about? Is Odissi really thousands of years old, and why is that relevant for us? The farce and fantasy of the Devadasi. The truth about India’s vast and varied temple dance traditions. Evolution and refinement through Odissi’s history, looking at: Desito Marga dances and what makes a dance “classical”?